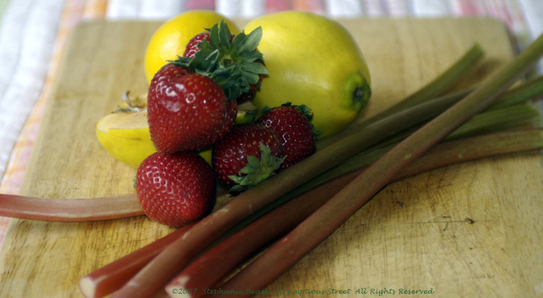 Rhubarb is another terrific Spring ingredient, I simply love its juicy and powerful tartness but am even more captivated by the way it sweetens and softens with a little bit of cooking and coaxing. This dessert was a spontaneous creation, borrowing pieces from a wonderful dessert I had recently in a small NY restaurant, a little from my Mom's strawberry-rhubarb pie filling, a little from the affinity of these fruits for cheese and the gritty and sweet-tart taste of quince. The granité recipe I found in Chef Daniel Boulud's "Cooking in New York City" cookbook and the combination worked beautifully. 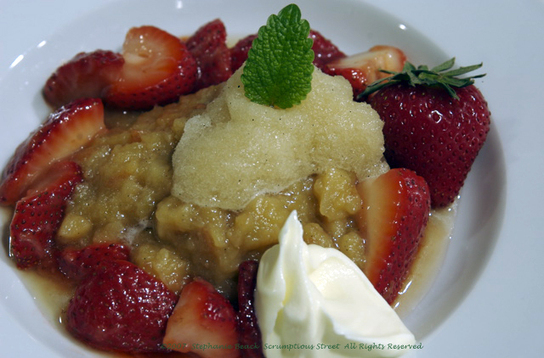 Here is my "Rhubarb and Quince Compote with Strawberries and Spiced-Apple Granité". There is a little surprise of fresh goat cheese under the quince-rhubarb compote and the hot fruit melted it and mixed in a gloriously rich and creamy way. The dollop of white you see on the side is mascarpone cheese, which worked as a great balancer of the other sweet and tart flavors. This is a simple yet very satisfying and different dessert. 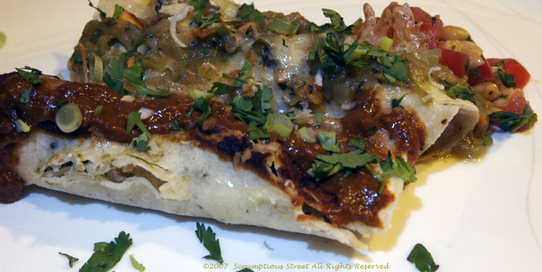 Our Scrumptious guests really loved how this one turned out! 1 1/2 c. sugar plus 1 T.
1. Wash, peel and slice fruits. Prepare the spiced-apple granité, recipe below. 2. In a medium pot combine water sugar, star anise, cinammon, vanilla bean seeds and pod, juice of 1 lemon and bring to a gentle boil. Add the quince and simmer about 40 minutes, until tender. Stir in the rhubarb and simmer another 10 minutes, until soft. Remove from heat and let cool. Strain, reserving 2/3 c. poaching liquid. Discard the spices. 3. Melt the butter in a large saute pan over medium high heat. Add the quince and cook until it is a light brown. Add the poaching liquid and reduce to a thick compote. Place the goat cheese in a dessert dish and spoon the warm compote on top. Add the strawberries, one more T. of sugar and 1/2 lemon juice and toss over medium heat for about 20 seconds. Remove and spoon around the compote. Top with scoops or quenelles of the granité and serve immediately. Add mint sprig and mascarpone cheese as garnish. 1. 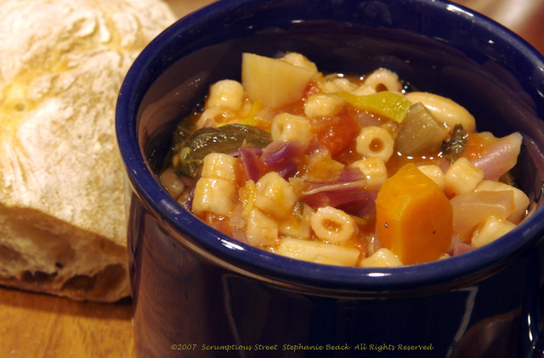 In a large saucepan, combine the ingredients and bring to a boil. Using a fine-mesh sieve or strainer, strain the liquid into a loaf pan and place in freezer. Stir occasionally with a fork until liquid is frozen and granular. Only after the Spring begins with the beautiful sunshine, the fresh mornings and the delicious and tender vegetables at the market do I actually feel just how much I've been waiting for its return. As a cook, photographer and food lover, it seems that I bide my time through winter-- keeping myself occupied and creating good food but never feeling as inpsired as I do when perusing the fresh produce that's available in the three other seasons. Although I love New York and I am so grateful for the tremendous number of Greenmarkets we have here I am often stunned when I realize just how expensive natural and normal things can be. In particular, morel mushrooms. I grew up hunting morels every May, in the mountains near where I grew up. We'd head out shortly after a rainy day in May, knowing exactly where they'd be and just how incredibly rich, flavorful and complex they can taste. My mom just told me last night that my Dad came home from work and told her about how he'd been walking on a path along the river and he could SMELL the aroma of the morels!! That's some talent, Dad. Morels are such a hearty and nearly meaty mushroom but with less of the fungal taste than others. This weekend, with a jolt of shock I realized I was paying $15 per pound for something we gathered freely in the woods. Still, the love of the morel and nostalgia for its taste won, and I paid the price. Although they weren't nearly as fresh and good as those straight from the forest, they were better than dried! 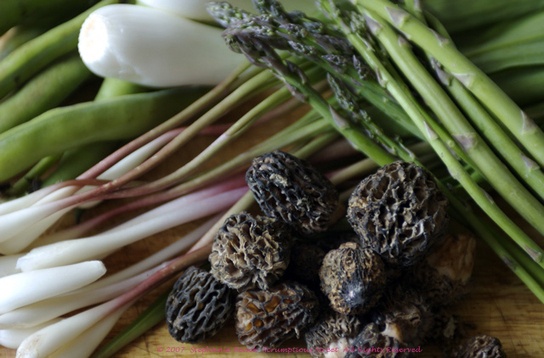 Morels go spectularly well with the other East Coast spring bounty of tender and nutty asparagus, fava beans and ramps. With produce this good, fresh and short-lived (most of them are only available a few weeks a year) my choice was to just barely dress them, cook them delicately and showcase the amazing flavors of the fleshy mushrooms, tender fava beans, young asparagas and subtle and tangy wild-leek ramps. This was a classic New York Spring dish celebrating the produce and those who grow it. 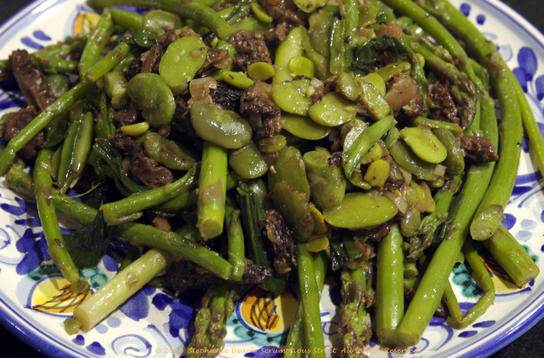 Here's my recipe for "Spring Morels, Fava Beans, Asparagaus and Ramps". 1. Shell the fava beans as you would green peas by snapping off the end and peeling back the string to reveal the beans inside. Place the individual beans in a bowl and set aside. Gently clean all the morels with a little water and mushroom brush. Slice open and wash out any extra grime or dirt on the inside. Dry with a paper towel. Quarter the mushrooms and set aside. Clean the ramps, removing the outer skin and trimming any roots off. Wash gently under water and dry with a paper towel. Mince the white and pink parts of the bulb, stopping at the green stem. Leave the green leaves whole. Wash and trime the asparagus, making sure to snap off any woody ends at its natural break. For this dish you want young and tender stalks. If any of them are wider than your pinky finger in diameter, peel them with a vegetable peeler. 2. Bring a large pot of water to boil on the stovetop. Prepare an ice bath in a large bowl. When the water on the stove is boiling, add about 1 tsp. kosher salt and place the asparagus in the water to blanch it. Boil just 2-3 minutes until the stalks start to soften slightly. Immediately remove the asparagas and plunge into the ice bath. Gently toss with your hands to cool the asparagus and then place them on a cooling rack over the sink or baking sheet to drain. Next, blanch the shelled fava beans in the boiling water for 30 seconds. Remove and plunge in the ice bath. 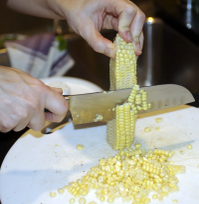 When cooled, remove the tender inner bean by squeezing the casing of the bean and popping it out. You may need to use the edge of a fingernail to pry open the casing. Set the cooled fava beans aside in a bowl. Lastly, blanch the leaves of the ramps for 15 seconds. Place them in the ice bath and spread out to dry on a cooling rack. 3. In a large skillet, heat the olive oil on medium-high until very hot but not smoking. 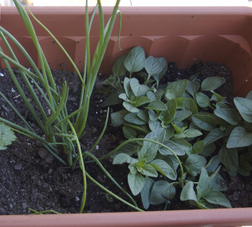 Add the minced ramp bulbs and saute for a couple of minutes until they begin to turn transluscent. Next, add the morels and thyme and saute until mushrooms become juicy and tender about 4-5 minutes. Taste and season with salt and pepper. Add the asparagus and fava beans and saute another 2 minutes or so, until all veggies are tender but not soft or mushy. Squeeze 1/2 lemon juice all over the vegetables, and taste again, adjusting any seasoning if necessary. 4. Remove from heat and serve immediately. This dish is so captivating, simple and wonderfully tasty that it makes me salivate just writing about it and remembering how good it was. 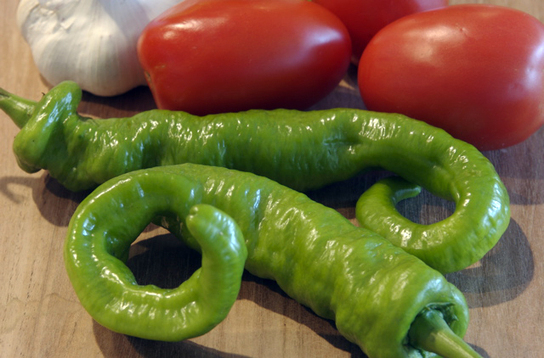 If you can get your hands on these vegetables, give it a try. Treat them gently and delicately and you'll be surprised how good it is. Can you see my ear-to-ear grin and hear that shivery sigh of relief? Ah, my heart is full of joy and beauty after a morning trip to the Farmer's Market. 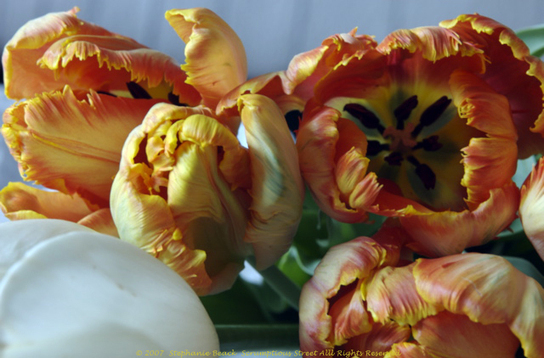 Finally, we're out of the crushing boredom of winter and I came home with armfuls of flowers and fresh produce. You will see the results of my weekend jaunts and meals soon, indeed. 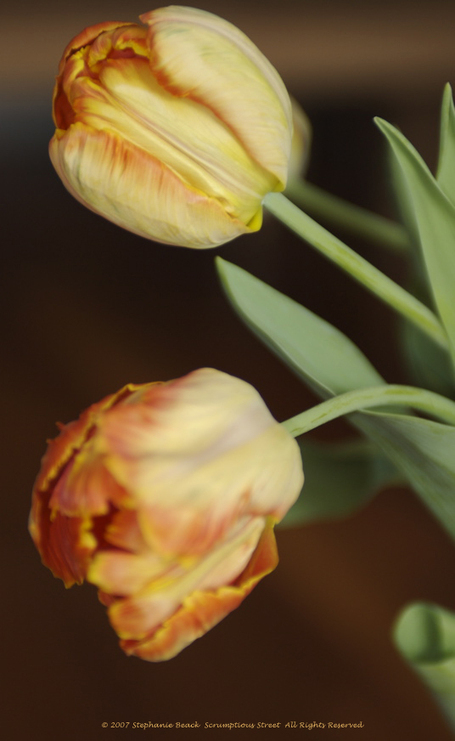 For now, here are some shots of the stunning tulips and lilacs I found. 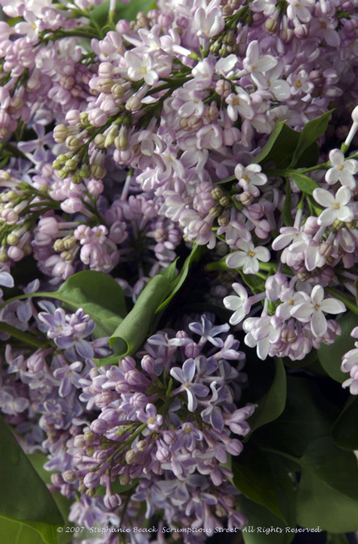 Lilacs are a particular favorite of mine, since they always remind me of my father. Lilacs are his very favorite. Hi Dad!! Hope you enjoy these. 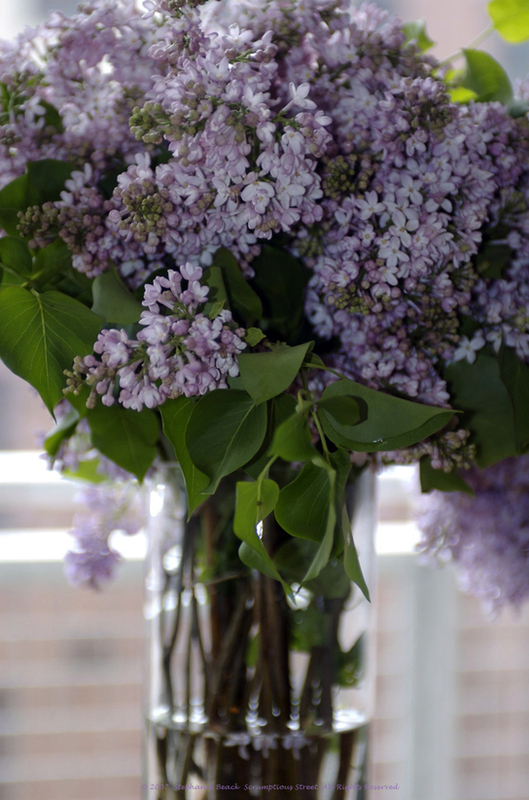 Their scent is filling our entire apartment! My mother is a gardening genius. When I was a child, for many years we had a garden the size of half a football field, just for our family of four. She fed our family for the entire year from the garden and I've always been in awe of her skilled green thumb. I don't have it. Many plants in my house have died. I bought my first flower bulbs last fall and planted them just before winter and all but about four of them appear to have not survived this crazy winter. None of those four will bloom, from the looks of it. This lack of skill has been frustrating and sometimes intimidating, given my mother's innate abilities in something I can't do competently. 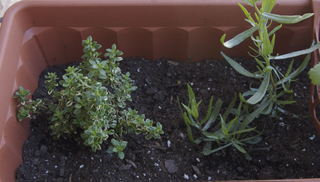 So, it is with both excitement and trepidation that I decided to have my first attempt at a "garden". 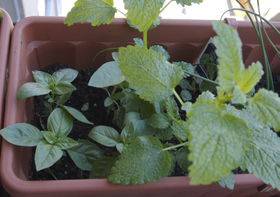 However small, it is afterall, a railing-planter and small pot on a New York tiny balcony kind of garden. 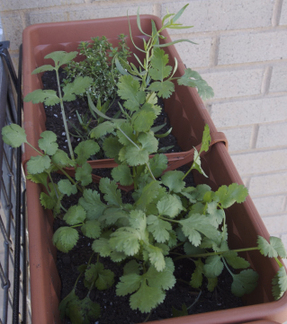 But, my joy and love of cooking overtook my hesitation at possibly failing again with plants, when I made my way to the Farmer's Market this weekend and purchased the small plants and seedlings for my first "garden" ever. 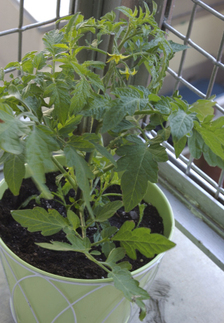 Granted, herbs and tomatoes, which should be easy, but still I desperately want it to succeed so that I can use the delicious bounty all Spring and Summer. 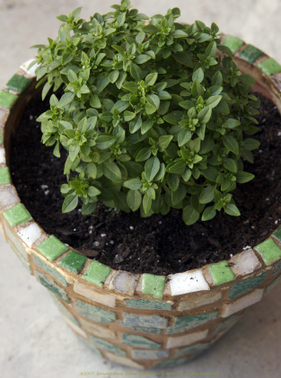 If any of you have tips for a winning planter herb garden, please share them!